The Israeli military has killed 40 Palestinians and injured more than 5,000 others – some with what appear to be deliberately inflicted life-changing injuries – during the weekly Friday protests that began on 30 March. In most of the fatal cases analyzed by Amnesty International victims were shot in the upper body, including the head and the chest, some from behind. 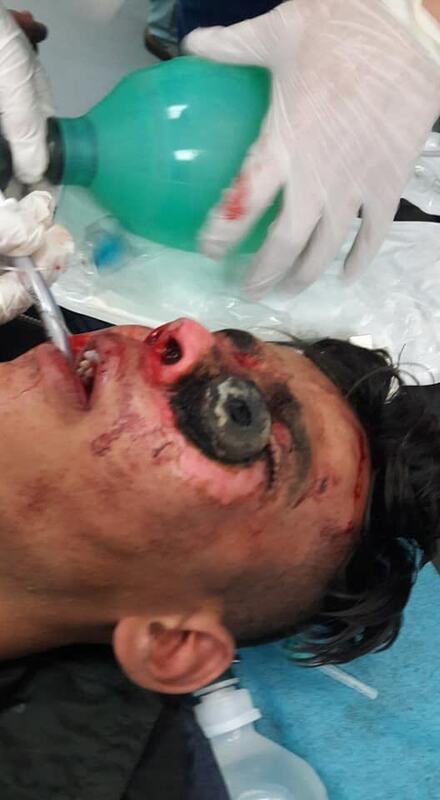 Eyewitness testimonies, video and photographic evidence suggest that many were deliberately killed or injured while posing no immediate threat to the Israeli soldiers. 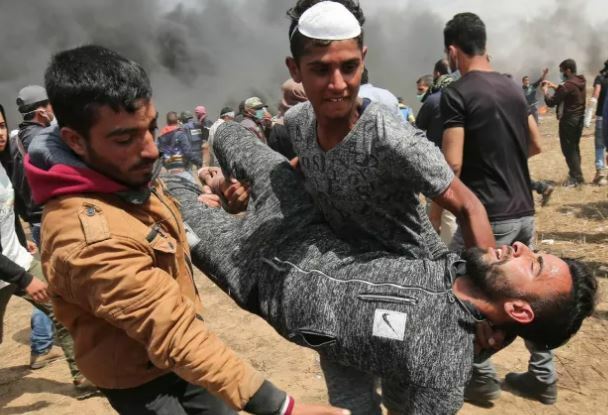 According to the Ministry of Health in Gaza, as of April 26, the total number of injured is estimated at 5,511 – 592 children, 192 women and 4,727 men – with 1,738 injuries from live ammunition. Approximately half of those admitted to hospitals suffered injuries to the legs and the knees, while 225 sustained injuries to the neck and head, 142 others were shot in the abdomen and pelvis, and 115 were injured in the chest and the back. So far, the injuries have resulted in 18 amputations. An injured Palestinian mother has been given the 2018’s “Woman of Palestine” award in an honorary ceremony held Thursday in Gaza. “Palestinian women have been deeply involved in the Palestinian struggle,” Women’s Affairs Minister Haifa al-Agha said in a speech delivered at the award ceremony. 32-year-old Israa Jaabees was detained by Israel in 2015 after being shot at by Israeli forces in occupied East Jerusalem. Jaabees sustained serious burn injuries on several parts of her body, for which she requires a number of surgical procedures, according to Palestinian officials. “They remain a powerful symbol of the steadfastness of the Palestinian people and had played a vital role standing up to the [Israeli] occupation”. The Israeli authorities accuse Jaabees of having attempted to attack Israeli soldiers with a bomb-laden vehicle — claims she and her family vehemently deny. 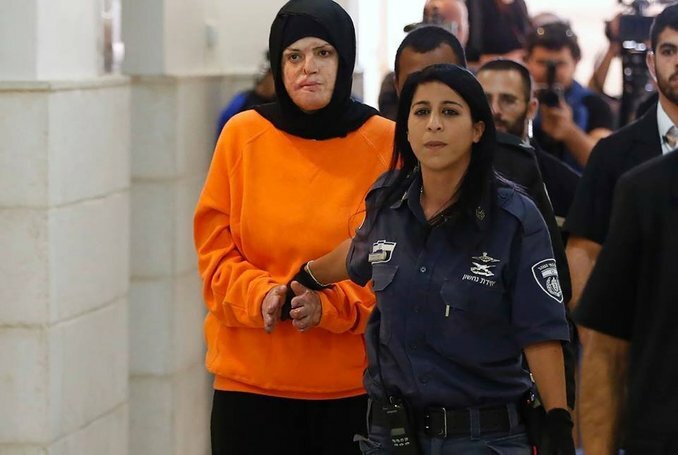 The head of the “Committee of the Families of the Jerusalem Prisoners” said an appeal to reduce the 11-year sentence against Isra due to her health status has been refused by the High Court of Justice, a prisoners’ affairs NGO said. 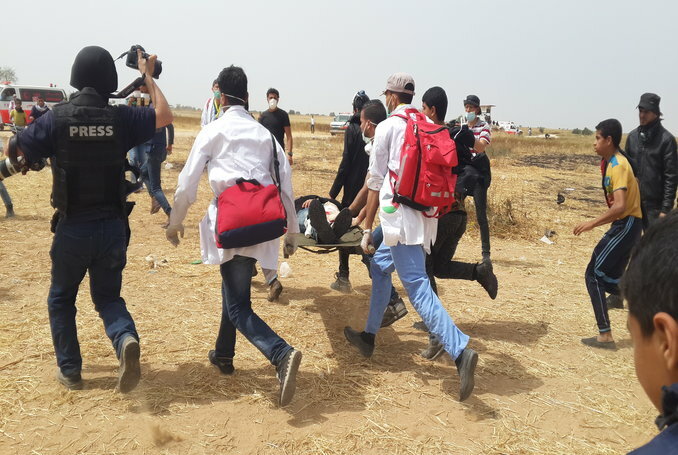 Three Palestinians were killed and at least 349 Palestinians were wounded Friday as thousands participated in the “March of Return” along the Israel-Gaza border for the fifth week in a row, according to the Palestinian Health Ministry. Ten of the wounded in this week’s protest, themed ‘rebellious youth,’ are reportedly journalists and medical staff according the Health Ministry. Of the wounded, at least 75 of which by live Israeli fire, four were medical staff and six were journalists, reported the ministry. Two of the wounded are said to be in critical condition, two in very serious condition and 73 in moderate condition. The committee organizing the protests said this week’s march is dedicated to “rebellious youth” to honor the thousands of young people who have come to protest every week at the area along the border fence. The organizers said that this week, too, the marches are supposed to remain a nonviolent mass protest. According to the Palestinian Health Ministry, youths scattered sand bags in several locations along the border earlier this week for protection against sniper fire. While Israel and some Western media label Gaza Palestinians’ ongoing, six-week protest a “riot,” what visitors and participants see on the ground is completely different. The tire and (Israeli) flag burning that may seem “riotous” to some are actually carefully planned by a coordinating committee to obscure the vision of Israeli snipers (the former) and serve as a peaceful outlet for frustration and anger (the latter). And while those activities are occurring on the front lines of the border protest, the “Great Return March” (so-named because of the desire of the refugees in Gaza to return to the homes they were forced to evacuate in 1948), also is hosting many family-oriented cultural celebrations. On any given day, you may encounter women cooking Bedouin bread, young men dancing dabka and children flying kites. Thousands of Gaza families take their children and head off to the border to participate in the Great Return March every day, raising the Palestinian flag and chanting the event’s motto, “We have the right to return to our ancestral land.” They sit on the ground, in sight of stolen lands just a few hundred meters away, while listening to their elders’ tales about their ancestral villages and towns. Elsewhere, depending on the day, visitors may stumble on a wedding celebration at one of the five protest encampments along the border. No one is keeping count, but photos of at least three march-camp marriage parties have appeared on social media. Mohammed Daloul, a 22-year-old groom, is among those who celebrated their marriage at a protest site. He invited all of his friends via social media, along with the hundreds of other Palestinians gathered at the border, just a few hundred meters away from the eyes of Israel’s snipers. The celebration prominently featured patriotic songs, such as those of Palestinian singer Mohammed Assaf, the Arab Idol singer whose tunes call for freedom and dignity. While the booming music carried clearly to the Israeli side of the border, the guests roared even louder, chanting for their right to return to their land. Daloul waved a Palestinian flag. During the second Friday of the Great Return March, protest organizers staged a series of “reading chains,” with participants literally sitting on the ground in a line, reading and discussing issues such as colonialism and imperialism. 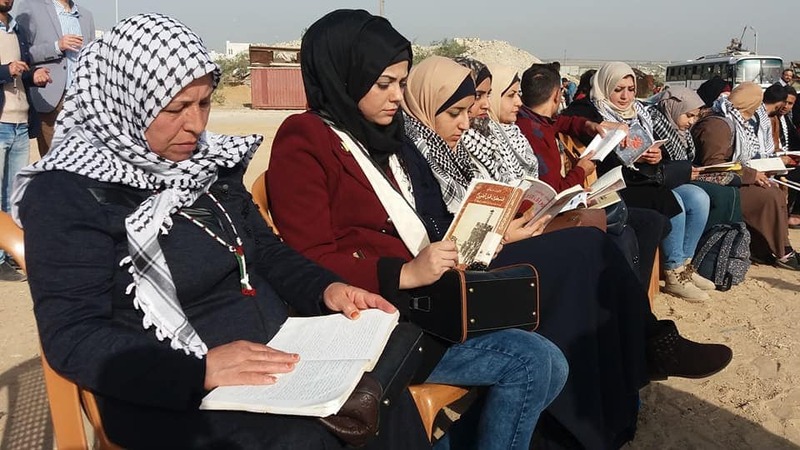 The reading selections are designed to raise awareness among youth raised under occupation and blockade of the forces that have shaped their lives, while confronting Israeli soldiers with peaceful resistance. On another day, young women wanting to leave their “mark” on the protest painted tires—which later would be burned to produce the smoke that effectively obscured the vision of Israeli snipers—bright pink, purple, blue and yellow, forming a line snaking throughout the camps. While there is a central coordinating committee for the march, the cultural activities are in large part driven by individual initiative. “These kinds of things can’t be controlled,” notes Abu Ertima. That means sometimes the demonstrators engage in some activities, like burning Israeli flags, that the organizers would prefer they didn’t. But the majority contribute to the overall festive and harmonious atmosphere. Preservation of Palestinian culture is the focus of many of the activities. 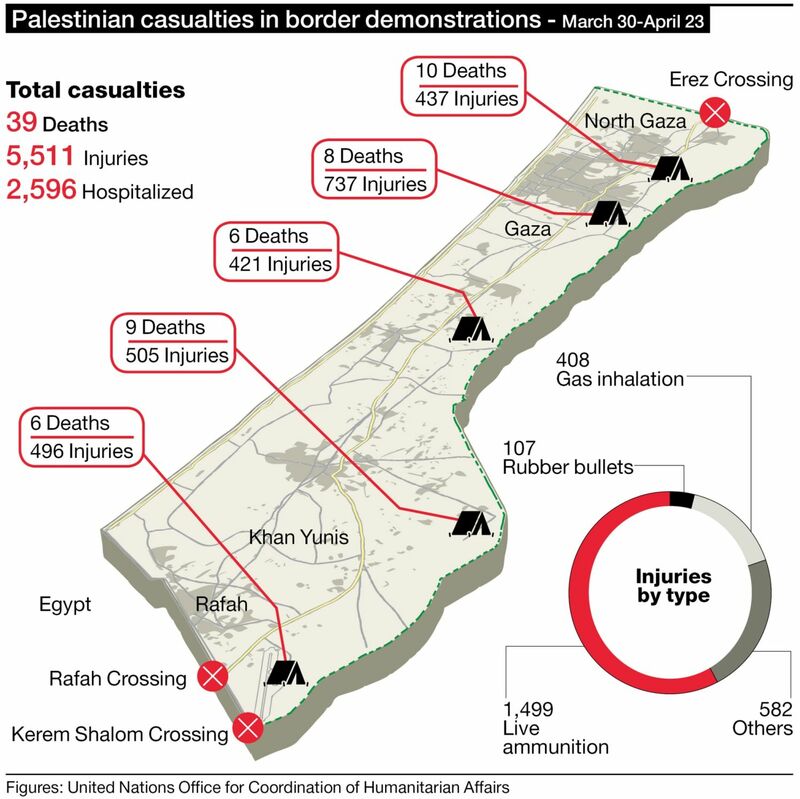 The Great Return March is in its fourth week, and the number of killed now is 40. But the frustration and despair fostered by 11 years of blockade continue to drive many Gaza residents to participate in, and even live, at the march. Once they get glimpse of their homeland across the border, they glimpse freedom. Gaza’s borderline has become a theater for artists and poets to convey a message to the world that they demand the basic liberties they have been denied for too long.